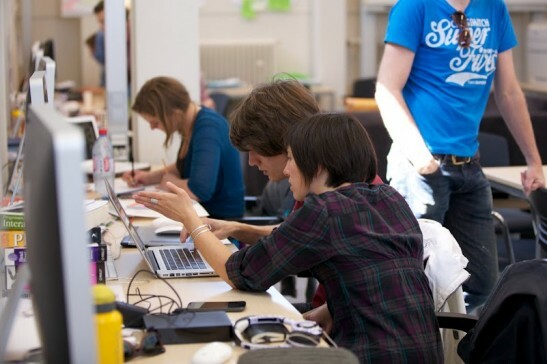 MediaLAB Amsterdam is expanding its scope and vision to create more positive impact on society. We will do so by launching a new initiative, The Digital Society School (DSS). In the DSS we will keep on working with multidisciplinary and international teams on projects for the creative industry. More information on the Digital Society School will follow shortly. Following an internship at the DSS Amsterdam offers you limitless opportunities to grow your skills and develop your full potential in innovative interactive media. It is hands-on learning at its best, involving practice-based work with a touch of research. You’ll be part of a vibrant interdisciplinary group during a semester and enjoy unique exposure to a network of experts within the field. Interested? Send in your motivation and portfolio / CV (in English) using this form and we will get in touch with you. In your motivation we’re interested in hearing, for example: why you are interested in being part of this programme, how your past experience relates to the kind of work you would like to do at the DSS, what you feel you can contribute to a team, and how you think this programme will help you in your future endeavors, etc. You will work in multidisciplinary teams guided by experts from the industry and the Amsterdam University of Applied Sciences. The team is a mix of designers, programmers, social/digital media experts, researchers, copywriters and storytellers. In twenty weeks (one semester) your team develops a working prototype in collaboration with the client. The team will be working 5 days a week in Studio HvA or at the client’s office. Within the programme there will be time allocated for documentation or graduation requirements/thesis work. The program is in English and available to all talented and motivated students or recent graduates from (Applied) Universities (please see conditions below). Unless stated otherwise, The Digital Society School only offers internship positions. Applications for regular, paid positions will NOT be considered. Semesters start in the first week of February (spring semester) and the first week of September (fall semester). Please mention which semester you are applying for. Applications should be done in English only. All our interns receive a stipend. Non-EU applicants are required to already have either a BA diploma, an MA diploma or be enrolled at a university. Alternatively, your home university should have an active relationship with the Amsterdam University of Applied Sciences through an Erasmus (Mundus) exchange program. Please enquire with your international office. Non-EU applicants are required to apply at least 2 months before the start of semester because of visa procedures etc. EU and NL applicants can apply up to 2 weeks before semester if positions are still available. Non-EU applicants are required to prove their ability to support themselves financially throughout the semester (requirement for visa). This is set by the Dutch government to around € 1000,- per month that you are in the country, family members can also act as guarantors. You have to prove that you have these funds freely available in case of emergency.